Aura Ambrose is a 15 year old girl who is living with the weight of the world on her shoulders. She is the only child of a schizophrenic single mother and she is attempting to live as though her life is as "normal" as everyone else's. Having never been in this situation myself it is not something I relate to personally but I pictured Aura's life like someone who is trying to "whack a mole". Every time she hits one problem on the head another one pops up. Aura's father has given up on this family and started another one with his rich young wife and new baby girl. As I read, I thought who would do this but then I remember all the Dr. Phil shows I have watched about situations just like this. This leaves Aura as the main overseer for her highly talented, artistic, mentally ill mother. She does her best to present a normal facade to the world but as her mother slips farther and farther into the darkness it becomes harder for her to hold it all together. I felt such sympathy for Aura as I read this. She is only 15 and has been thrust into the role of the adult in the household. She is like a babysitter who has been left in charge indefinitely but has no real authority or even a driver's license. To complicate matters further, her greatest fear is that her own artistic talents will ultimately lead her down the same dark path. I wanted someone in her life to care enough about her to see what was happening and offer to help. When Aura finally has no choice but to ask for help, it opens new doors and insights into her mother's life and her own. This isn't a subject matter that is often talked about and I think it opens avenues of thought and discussion about mental illness. I liked the book and the characters very much. There is a little bit of romance that gives a little relief to the heaviness of the material. There was quite a bit of language in the book that I could have done without and would cause me to warn parents about letting a younger teen read. 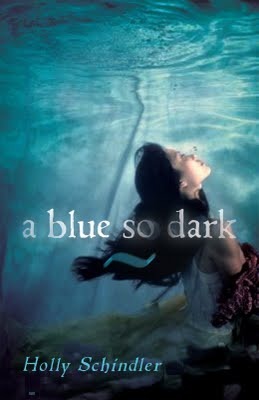 For more details go to A Blue So Dark on Parental Book Reviews. Janeth, another great review! I will definitely check this out. I actually read a memoir by woman whose mother is schizophrenic called RESCUING PATTY HEARST. Good read. P.S. You raised a great daughter. Happy belated Mother's Day! This is the second time I read the synopsis and the review. It reminds me of Sybil over and over again. But I wonder what kind of case that she face out of her schizophrenia mother. Amy....thanks so much for the kind words and the Mother's Day wishes. And, I definitely agree with you about my daughter but she is who she is through the grace of God and I am very thankful for that. Wow. What an emotional and powerful book. I've never known anyone with or read a book on schizophrenia before, so this was my first introduction to the disease. Holly Schindler created a vivid world where Aura was the caretaker in the mother/daughter relationship and her mother required near constant care. She described how the illness slowly consumed Grace and threatened to control Aura in a very believable way.